The graphic design emphasis encompasses the full scope of visual communication. Learn the basic concepts of composition, layout, and orderly visual composition; then learn to design for both print and electronic media. You’ll discover how typography can be combined with illustration and photography to create powerful visual communication. Students have access to a multimedia environment equipped with Mac computers, video and digital cameras, scanners, laser printers, 3D printer, and animation and photo manipulation tools. 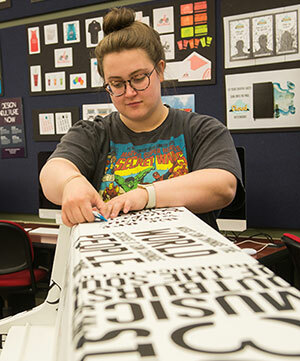 Art faculty at the University of Lynchburg have created a well-rounded program. You’ll graduate with a solid background of technical knowledge and the ability to produce graphic design solutions to real-life work situations. Requirements for the graphic design emphasis consist of general education and core curriculum courses; art courses; and courses specifically created for the graphic design concentration.